As the title suggests, it's Saturday and by coincidence, it's July 2nd. The city where I live is holding its July 4th (Independence Day) celebration today instead of on the proper day. It has something to do with paying workers overtime on Sunday to set-up. I've heard that it's a $75K savings to the city treasury. While I'd normally say what the f&%k?, part of me agrees. AND we can celebrate independence twice. Any excuse for a second party is a great excuse. So in keeping with the fact that it is Saturday and there will be fireworks at the park, two blocks away, and there will be a family/friends gathering at the mansion. If you're showing up bring something. If we lived further out in the country there would be more home-made pyrotechnics as I explored my ammocentric proclivities publicly. However, being in the city and because there will be local off duty city and county police types here at the house, I will restrain myself. However I've found that off-duty police officers are often even more ammocentric than I am, and that's saying quite a bit. When I explore my ammocentric nature, I feel more unburdened, as if the social yoke has been lifted from my shoulders - as if I'm really being ME. And let me share that taking an (insert California-legal firearm here) to the desert with a lot of ammo can help me shed stress in ways that most progs would call 'indecent'. Targets are annihilated. I wonder if ammocentric people will become a protected class in America? It's every bit as legit as black guns matter. Shooting is how ammocentric people express themselves and pursue happiness. Progs want people to be recognized and to feel special about pursuing happiness. When Planned Parenthood wants to slaughter the unborn at a pace that would make an Aztec priest blush, it's all chalked up to the pursuit of happiness. 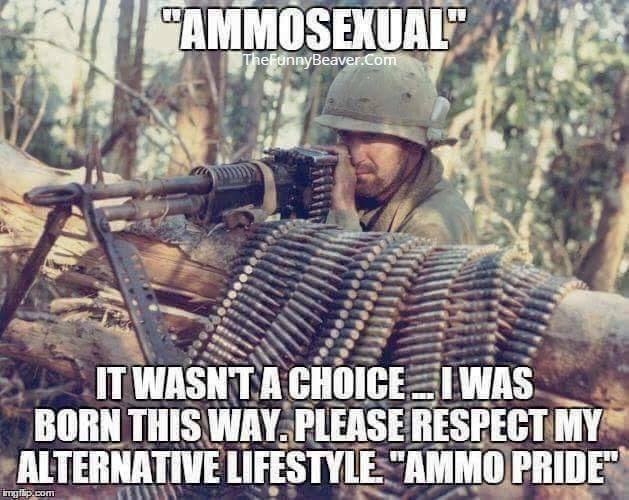 Historical Discrimination for the Ammocentric! The ammocentric clearly weren't recognized as a protected class by the British Government on April 19, 1775 when a skirmish line of minutemen stood up to the vanguard of about 700 British Army soldiers who had begun their march before dawn to seize weapons owned lawfully by Americans at Concord, Massachusetts. The force, under LTC Francis Smith fired the first shots just as the sun was rising at Lexington Green. The militia were outnumbered, fell back, and the British Army regulars proceeded on to Concord, where they broke apart into companies to search for arms and ammunition. At the North Bridge in Concord, approximately 400 militiamen engaged 100 regulars from three companies of the King's troops at about 11:00 am, resulting in casualties on both sides. The outnumbered regulars fell back from the bridge and rejoined the main body of British forces in Concord. The British forces began their return march to Boston after completing their search for military supplies, and more militiamen continued to arrive from neighboring towns. All of those patriots were shamelessly ammocentric. Gunfire erupted again between the two sides and continued throughout the day as the regulars marched back towards Boston. Upon returning to Lexington, Lt. Col. Smith's expedition was rescued by reinforcements as they made a tactical withdrawal under heavy fire to Boston. Progs would have you forget that. They would much rather that you honor communist community agitators like Barack or Al Sharpton today (and every day).